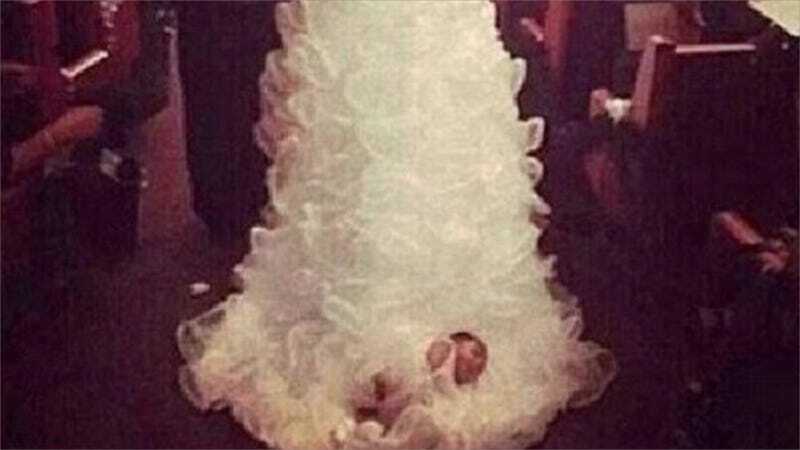 After news broke that a Tennessee bride had altered her wedding dress to accommodate her infant child being dragged down the aisle behind her, Shona Carter-Brooks defended her sartorial choice, explaining that her "1 month old was awake and well secured on my train." Ripley TN we den went exclusive, we made the radio The Official KBLX Fan Page today! People questioning what we do, commenting all negative, and just doing the most. We good though we covered by the Blood which never loose its power. So to the media, radio, news, and whomever else wanting to talk about what WE do here you go: Media Media I see how it works regardless the situation or purpose people gone have something negative to say! The answer is we do what we want when we want long as Jesus on our side everything worked out fine and gone continue to be fine. Our 1 month old was awake and well secured on my train. Most important while yall got ya feelings in us we had our hearts in Christ which covers all!! So keep ya mouths running for it was just that Exclusive and Epic enough we made top blog way from small town Ripley, TN and the social media doing what they do, TALK!!!! Who paid yall for yall comments, none so watch us as we do us! Too bless for mess!! Thank God we aint no celebrities oops got fans, guess we is! Sign off Mr & Mrs Brooks!! When declining to comment to BuzzFeed, Carter-Brooks said in an email, "Understood everyone entitled to their own opinion so all I have to say is God bless you!" It's so comforting that even though sometimes it feels like life is pointless, we have people out there proving that it's worth it to keep going, if only to watch them live.